The weekend is just around the corner. Gonna cook at home or makan outside? The other day Mamarazzi lazy again. Was chatting with Green Tiger and lamenting how Mamarazzi's steam chicken always not nice geh. Then Green Tiger taught her. Marinate the chicken by giving it salt "massage". Kasi all the daki go away . Leave it to marinate for half an hour or so. Then don't waste time. have to make dipping for the chicken pulak. Next have to cook the chicken right? Green Tiger mentioned about Chicken Soup that her mom made from the water which was use to boil the chicken. 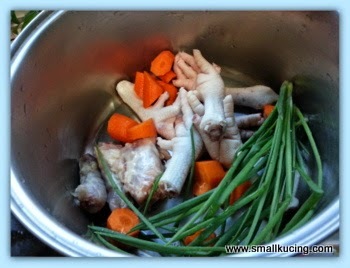 Being lazy, Mamarazzi just throw in some chicken feet and whatever spart parts...add some carrots, spring onions, ginger slices and put in the chicken to boil la. By the time Chicken is cooked , the soup okay liao. Just take out the chicken from the pot and put it into iced water. According to the expert , it will makes the meat more "boing boing". Take it out from the ice water and let the water drain before chopping. 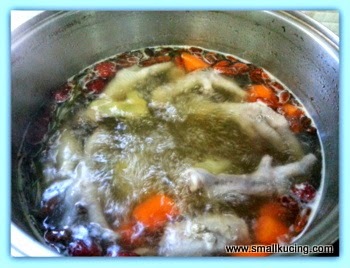 Meantime, she threw in some Goji and red dates and made chicken soup out of the "water". Time to chop...alamak...betul betul Lesen Kopi O. sooooo messy. Haiz duno why the wings cooked till dropping off already but the bones still red. Maybe coz she used frozen chicken kot? Must try chicken from pasar next time. Mau cantik lagi? errr...add some spring onions and "smelly" leaves on top lo. Pass or not? 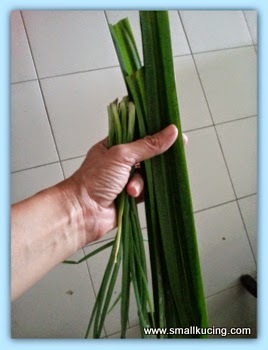 As for the rice...chicken rice.....get some pandan leaves from the garden. Add some of the soup to cook the rice....Jeng! Jeng! Jeng! Chicken Rice! Vege how? 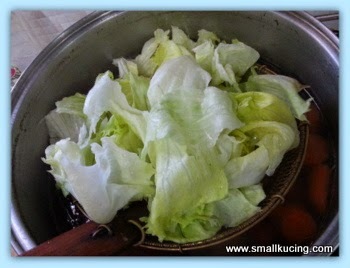 Aiya...easy la...don't waste water...just blanch it in the big pot of chicken soup lo. The soup is oily enough. No need to add garlic oil on top of the vegetable. Want it to be prettier? Just add some fried shallots. Papa said the chicken soup so sweet. Apa macam Sifu Green Tiger.? Pass ka? Whatapps later okay. 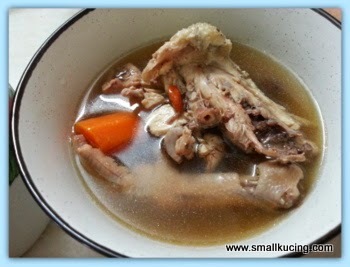 This looks so good, it is how I make my chicken soup. I know why it was cooked but still red at the bone. I saw the answer on T.V. cooking show. This means it was a very young bird. Morning mamarazzi.. Tuk tuking from my phone.. Today not going to work.. Took leave.. G will be starting his first day at the nursery.. Mum's not taking care of him liao by the way.. I always like chicken rice.. Can't go wrong one.. Only the rice pun sedap dah.. Mamarazzi very clever know how to chop chicken.. 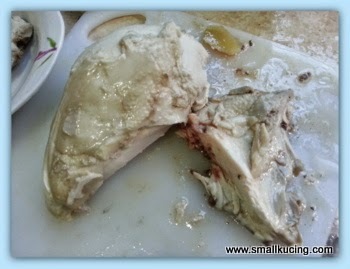 I dunno how to chop whole chicken leh.. Usually ask the guy to chop into pieces for me..
Mama meow, lei hai tak geh! Passed! You did better than me, mama kucing. I also never good at chopping chicken. Haha. 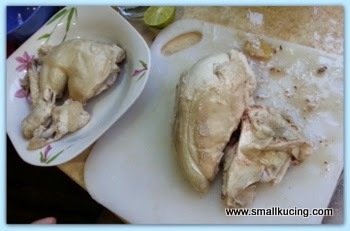 I lazy to put chicken in iced water, just chop them once they cool down. Ya this is what I called comfort food. 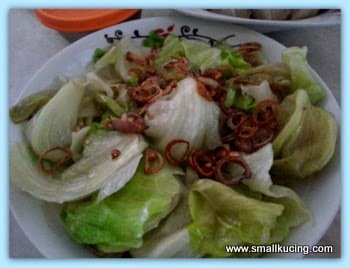 Simply cook also is taste yummy than outside food you know... Look at the phak zham kai... I want it too. Use the soup to blanch the vege...definitely is a good idea too! I like this. Can i reserve the chicken soup when i go KL? Boleh? So sedap, chicken rice! Don't worry, I also cannot chop chicken nicely. The chicken pieces tunggang langgang, some more "phoon chee see kay" (splatter all over the place). yummmm!!! looks so good! (': hungryyyyy. The soup looks so nice... I like home made chicken rice than some stalls, but have to wait when the mother got the wind/semangat to cook, haha. 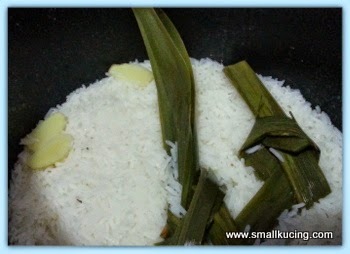 Her recipe for chicken rice is: chop up a lot of garlic (mau kurang pun boleh, but won't be so wangi), and fry together with the washed (still uncooked) rice for a bit (according to her, "until half cooked"), then put everything in the rice cooker (with chicken broth and pandan leaves). LOL I cooked this yesterday too! Yes very easy, one pot becomes 3 dishes. I also use the soup to blanch the vege! But I usually use chicken stock cubes to cook the rice so that I don't have to wait until the chicken is cooked before I cook the rice (start parallel). Saves time! wah, looks like Mamarazzi's chicken + chicken rice + chicken soup all very "hor liao" leh.. outside sure not able to have such taste one lah.. errr, chicken looks pale?? then Mamarazzi go and buy "choi yuen gai" lah, sure looks more yellow one, or is it "kampung gai" which gives better color?? hahaha, pardon Uncle SK lah, you know lah, he doesn't cook one mah.. chicken Uncle SK doesn't know lah, but his friends told him hor, the chicken rice if want to be more yellowish, can add in Planta lah, color nicer and also more fragrant woh.. So many dishes from just one pot. Well done Mamarazzi! 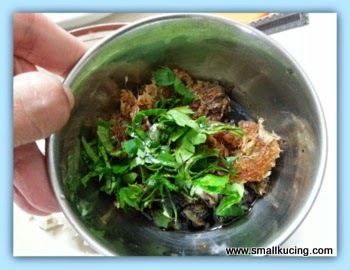 Small kucing also can't wait to eat first because it is so tasty. Wahhhhhh! If like this is done when malas, dunno what Mamarazi cook when she's rajin lar. I'm always for the one-pot-cook-everything method. It looks absolutely delicious. A few more of these, and you could have a really nice recipe book ;) Sorry I've been absent. I had a mini vacation, but am back now in the swing of things. Psssstt!!! I an curious who is this Green Tiger? Got harimau hijau in Malaysia ka? So Papa loved it and found it delicious! He is so easily contented man. We like Kaldip! 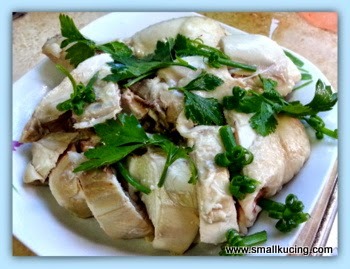 Chicken Rice always looked so simple and easy to make but a good one in not easy to roll out from kitchens. Looking at the photos I knew that Mamarazzi has cooked a fantastic Nasi Ayam! She can open shop next to the Ipoh Chicken Rice Shop now! Weekend we usually eat out, cause MIL cooks 5 days already for weekdays, hehe! You are so geng la, all the dishes looks yummy! I'm a huge fan of one pot dish too, so convenient! Your cooking looks yummy! Lovely meal. You sure can cook Kathy. That chicken with sambal belacan?? Ah, will be so good. Great job on the plate of chicken. Kudos! Psst.. normal tap water (filtered better) can do too. The water makes the chicken juicy and smooth (waard). I like the way you cook the chicken!!! I should have dropped over at your place ... and wait for you to cook this exactly the same for me... hahahaaa... looks so sedap! I love one pot meals, but I think I would leave the feet out.